Information is a recognized fundamental notion across the sciences and humanities, which is crucial to understanding physical computation, communication, and human cognition. 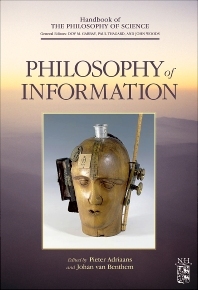 The Philosophy of Information brings together the most important perspectives on information. It includes major technical approaches, while also setting out the historical backgrounds of information as well as its contemporary role in many academic fields. Also, special unifying topics are high-lighted that play across many fields, while we also aim at identifying relevant themes for philosophical reflection. There is no established area yet of Philosophy of Information, and this Handbook can help shape one, making sure it is well grounded in scientific expertise. As a side benefit, a book like this can facilitate contacts and collaboration among diverse academic milieus sharing a common interest in information. • First overview of the formal and technical issues involved in the philosophy of information • Integrated presentation of major mathematical approaches to information, form computer science, information theory, and logic • Interdisciplinary themes across the traditional boundaries of natural sciences, social sciences, and humanities. Researchers at the intersection of philosophy, computer science, informatics, logic, linguistics, cognitive science.